Tamsen Webster, executive producer of TEDxCambridge and public speaking strategist, says stage fright leads marketers to miss huge opportunities to differentiate themselves. Consider that 68% of B2B marketers use in-person events and 58% use webinars and webcasts as part of their content portfolio, according to CMI’s 2017 Benchmarks, Budgets, and Trends—North America. And roughly one-third call events “critical to success” in 2017. 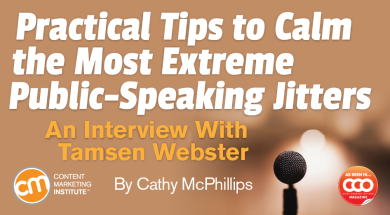 Now read on for practical tips plus a big dose of confidence to quell even the most extreme public-speaking jitters. 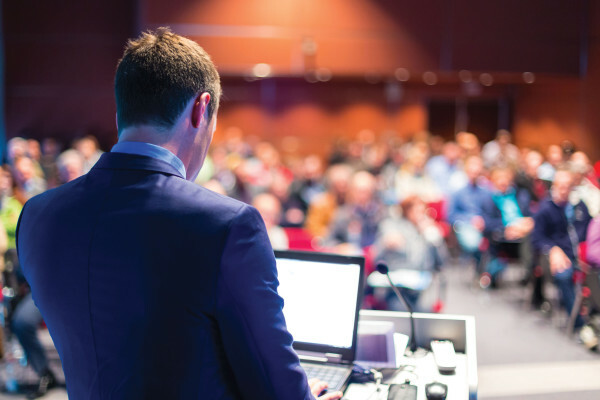 CCO: Why is public speaking so important? Webster: Nobody else can be you. When you speak, you’re the only one who can speak. Other people can write for you. Other people can produce content for you. Nobody else can speak for you. When it comes to finding your niche, it’s an unparalleled opportunity for others to understand what makes you an individual (or what differentiates your organization). What your business stands for, what you stand for, how you interact with people, how you hold yourself, how you present that information … all of it speaks volumes going way beyond the words you use. CCO: What if you don’t have great speakers in-house to represent you? Webster: Any well-crafted piece of spoken communication can overcome fault in delivery. A lot of people focus on how smooth or polished somebody is in their delivery, and they think that’s the thing that makes them effective. Entertaining does not equal effective. Comfortable doesn’t equal effective. Effective means saying something that can directly benefit another person and explaining how to act on the information. Your skill set enables this, not your “gifts” or “talents.” Of course there are things that people can do to improve their delivery. Delivery weaknesses are fixable except one: Not believing what you say. Get somebody to speak about something they’re passionate about, or something they believe deeply in, and they’re wonderful. CCO: For someone who’s inclined to be jittery or who isn’t experienced, are there certain formats that work best? Webster: Different people have different preferences for the form of speaking they feel comfortable with. There’s a word I love: consonance. It’s a synonym for congruent or integrity, but I like it because it’s the opposite of dissonance. Dissonance happens when we’re not comfortable with something that we’re saying – and our audience feels this. I’m explaining this because it’s important for a speaker to figure out what forms of speaking are the most consonant for them. If you prefer to lecture, seek out that type of opportunity. If you relish a back-and-forth conversation, look for that format. If you are best when you are answering questions, seek that out. When organizations have a call for speakers, suggest another format if you are not comfortable with what they describe. It doesn’t mean they’ll always accept it, but you can at least try building on your own strengths. If you really like talking and interaction with somebody but your communications team constantly puts you up as a talking head, your dislike for that format is going to show. Try to get rid of that barrier to good communication. CCO: What advice can you offer to improve your visual delivery? Webster: If there is visual support, you should prepare it last. Any great talk should be crafted in such a way that slides are not necessary. I believe that wholeheartedly, 100%. Whatever you want to say, you must create the talk as if you didn’t have visual support. I’ll get to what some of those creative things can be, but here’s why that’s so critical. Technology fails. If you are reliant on your slides to deliver your message, you don’t even need to be there in the first place. This is an irreplaceably great opportunity for you to be in front of other people and uniquely you … and that’s terrifying for people, which is why they like to hide behind slides. Also, because technology fails, always have a handout at the ready. It can save you if your slides go dark. If you plan your talks as if you didn’t have any visual supports two things happen. One, you automatically simplify the talk. You simplify it to a point where people can actually process it. We put so much information into our slides that we are killing people’s ability to absorb any of it. We like to bury ourselves in these statistics that visual information helps people retain knowledge. That’s true if it’s a single thing – not 78 slides over the course of 45 minutes. You are battering people with information that they cannot absorb. Without the slides, you automatically simplify. If I don’t have a slide to show you then I have to think about how to talk about this in a way that you can picture it in your head. The process is like building a house. First you lay a foundation, which is essentially your domain of authority, what you’re passionate about, and what problem in the world that you can solve. Then you begin to frame out the house. All that said, visuals can add incredibly powerful mnemonics and memory devices to the things you say, if used correctly. When there is a slide for every point you make or a visual for every single idea, it is the visual equivalent of speaking in monotone. The brain cannot process that point A is significantly more important than point B because visually they are weighted equally. For less important points, don’t treat (them) visually or if you do, use only text or something simple. For your major big points, treat those with a full-bleed image or the like. Whether you explain it or not, subconsciously your audience will pick up that this was a big point. Also: Use your visuals in an engaging way. Tim Riesterer talks about whiteboarding and flip-charting – and specifically drawing in real time. It’s more concrete and gives you immediate authority because you aren’t just relying on slides. It has to be in your head in order to drive it. Plus, people get more mentally and intellectually engaged because they start to try to guess where you’re going. They try to complete what you’re saying in their heads. CCO: Any other storytelling tips? Webster: I used to work for a company called Oratium and we talked a lot about the power of neural networks. The concept is, you take the same idea and plant it in multiple parts of the brain at the same time. If I tell you, in this moment, imagine a pink elephant with a scary clown on its back juggling sharks … you have an image in your head. You have never seen that combination of things, I hope, in your life. Yet, the minute I start to tell you a story, you can see it. A colleague tells a story about how he came back from a weekend trip to find that his college roommate had disassembled the dryer in the driveway. He tells the story because it’s linked to a point he’s trying to make. Everyone who listens to that story pictures the disassembled dryer. You just do. That’s part of why storytelling is so powerful. If you have a story, try to add sound to it or have a mental image illustrate a point. All of those reinforce your message. In one of my talks I explain the concept of cognitive dissonance. I use a recording of a Mozart piece called A Musical Joke, which is written to be dissonant at the end. It’s a way to point out that others can hear when something doesn’t sound right even if they can’t quite explain why. And by the way, there’s a black screen up when I do that. Why? Because I want people to listen. In presentations, try to create an experience to communicate a particular point. Sometimes it’s going to be a full multimedia extravaganza. Sometimes it’s going to be lights and sound. Sometimes it’s just the human voice telling a story. The best speakers understand that if you do the same thing all the way through your presentation, you’re weakening your point. Great presenters figure out how to mix and match – whether by a demonstration, using a whiteboard, playing a video clip, etc. If I’m talking about lessons from TEDx or demonstrating what works well, I use a short clip from a great TED talk on how to use one paper towel. I will take four-and-a-half minutes of my own presentation and dedicate it to that video because there’s no better way for me to land that point. Showing videos, by the way, if they’re short enough, also resets people’s ability to pay attention. It changes the format. CCO: What’s behind the fear of public speaking? Webster: People fear the physical reaction they experience on stage. Most people do have a physical reaction, which is normal. Most stage fright is related to those initial moments. We’re pack animals. We’re not designed to have all eyes turn toward us. That’s a really uncomfortable sensation. Stage fright has two principle causes. First, people fear the physical manifestations of nervousness. Sweating, trembling, flushing, and a knotted stomach are all normal reactions to stage fright, but those who are most paralyzed by the fear worry that those reactions are not normal. True and debilitating stage fright stems from not understanding that that reaction is normal. I had a panic disorder for 17 years. I literally had panic attacks onstage and had to figure out how to get past it because for me, the message was more important than any discomfort I felt giving it. That experience informs my belief that anybody can do it. The second principle cause of stage fright is when people don’t think they are familiar enough with the material or when they’re speaking outside their domain of authority. My approach to coaching is grounded in the message. Focusing on your message takes the pressure off any delivery anxiety. By working through your message and practicing it repeatedly, by the time you deliver it, you know it inside and out. Once you take that factor away, everything that’s left is just tweaking. Overcome your fear and share your insight by presenting at Content Marketing World 2017. Speaker submission proposals accepted through December 12, 2016. Fill out this form and get all the latest on the CMWorld website.